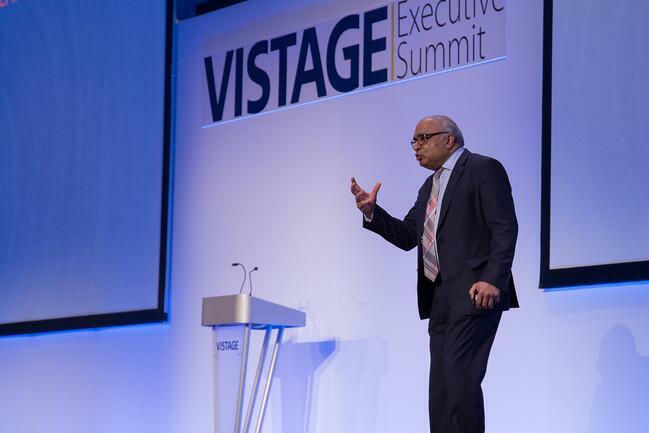 A true veteran of the executive world, Dr Balaji Krishnamurthy has led sixteen businesses over thirty years. Today, he is CEO of Portland-based Think Shift, offering transformational marketing consultancy services to businesses including Jaguar, CropLife International and Canterra Seeds. 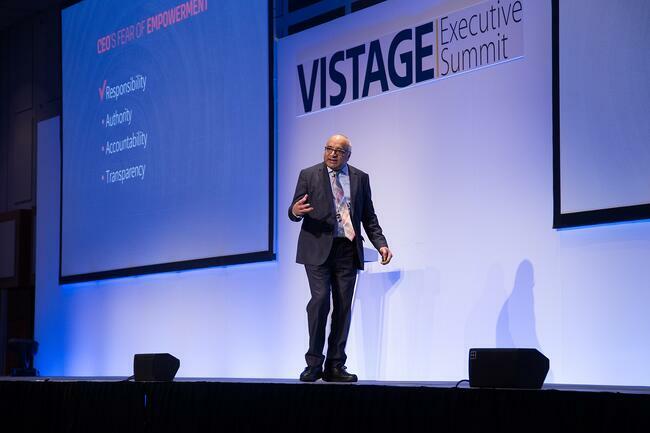 Vistage: The thrust of your talk is around attracting and keeping talent within organisations. What are the biggest talent management challenges facing business leaders today? Balaji Krishnamurthy: When I walked into the workforce forty years ago, my concept was very simple: honest pay for honest work. I think a lot of people of that generation, and for quite some time since, had this same belief about their work. If you do a good job, they’ll pay you well, and that’s how you succeed. You expect to get paid well, because you’re going to do a great job. This contract was implicit in the workforce. Yes, some didn’t trust their employers, while others did, but that was the general nature of the contract, and the pay was in cash. As you grew, pay was also delivered in cash-like instruments – like equity and options, and so on – but it was cash, first and foremost. In the phrase honest pay for honest work, notice that pay is the objective, and work is the vehicle. I do my job so I can live a good life – the life I want to lead. The world has since changed. For the talent that is entering the workforce, or has just agreed to enter the workforce, the model is a little different. Their motto is meaningful work for meaningful pay. There are three differences between my model and this model. First of all, notice that mine was honest pay for honest work. Pay was the goal, work was the vehicle. In meaningful work for meaningful pay, work is the goal and pay is the vehicle. Second, meaningful work as opposed to honest work. Honest work suggests I do a good job, while meaningful work suggests my job does good in the world. Third, my goal was honest pay - which means I get paid well, so I can do things with it to make my life better. What people are looking for now is meaningful pay, not just counted in dollars or pounds. Instead, pay is counted in terms which are meaningful to them. If time is more meaningful to me than cash, time might have more value to me. If opportunities are more meaningful to me than cash or time, then opportunities are more valuable. The individual has a different value system, and the employer needs to offer that individual a ‘payment’ that meets their value system. In turn, employees are motivated to do meaningful work. In their work for their employer, they need to feel they did good in some dimension of their interest. VS: Does meaningful work mean a purpose for the business, or purpose for the individual? BK: The individual – however they want to structure it. The individual might be a hedge fund manager seeking to beat the market. The individual might be a rock climber who wants to ensure their environment is healthy and nourished, so they can continue rock climbing. Whatever work they do for their employer, employees wants this to represent the value system they have – whatever it might be. The hedge fund manager and the rock climber are going to have two different value systems. VS: For many, this notion of meaningful employment didn’t previously exist. A job was a job. BK: That’s right. The company had a business, and that’s what you did. Now this isn’t enough. This puts a certain onus on the employer. Whereas they might have once stayed silent on social issues that were irrelevant to their business, employees today don’t want their employer to stay silent. They want them to take a position, so they can at least know their employer’s position on issues is compatible, if not aligned, with their own. In the event that it’s not compatible, they actually want to part ways. We didn’t think of parting ways because we didn’t agree with our employer. I think there’s a fundamental difference between honest pay for honest work and meaningful work for meaningful pay. A lot of what we see in today’s workplaces can be explained within this construct. VS: What does this mean in practice, for business leaders? BK: Now, businesses have to have a very clear purpose. They must be able to state why they exist. That purpose is not about making money. Of course, one would argue that a for-profit business is there to make money. Well, that’s like saying my purpose in life is to make red blood cells. Yes, I’ve got to make red blood cells or I’m going to die, but when I wake up in my mid-life crisis and ask, ‘What’s the purpose of life?’ I don’t say to myself ‘red blood cells’. Businesses have to make a profit or perish, but that’s not their purpose. The purpose they have must transcend the activity of the business. People tend to define the purpose of their business based on their activity. FedEx might say, ‘We want to make sure everybody has their packages. We want to make sending packages very easy.’ That’s activity. Their purpose must be something beyond this. Compare a McDonald’s employee with a Starbucks employee. I think there would be universal acceptance that the Starbucks employee is more engaged in the workforce, and that Starbucks manages to recruit into their employment people of a different calibre than McDonald’s does. This isn’t because Starbucks pays more, but because the business gives employees an environment in which to make a difference. This shows in the business model they’ve created. Both are public companies. McDonald’s has a 38% gross margin and Starbucks has a 59% gross margin. Both have a similar business model. They buy stuff and hire people; have people come through the door and order at the counter; people make the product and hand it to you; they keep their tables clean and provide free Internet. That’s the model. But that’s also the business, right? They have the same costs in any one of those items that they both sell, and yet Starbucks are able to charge an amount that gives them a 59%, 21-point difference in gross margin. Why? Because their employees create an environment that causes you to feel like you’re not receiving coffee; instead, you’re getting a coffee experience. It’s like going to the theatre, not buying a video. At McDonald’s, you’re buying a hamburger. At Starbucks, you’re buying time and an experience. This distinction between the two businesses is a direct result of the environment they’ve created for their employees. That environment is the result of the attitude they have about their employees. The barista at Starbucks honestly believes he’s changing the world one cup at a time. It’s about changing the world; not about serving coffee. VS: Does the recruitment talent-scouting process therefore come from the mission and vision of the business? BK: It’s even more fundamental than that. It is the purpose of the business. My company is called Think Shift. We call our purpose potentiality: that is, releasing the potential in people, intentionally. If I work with you and can persuade you to accept this concept, and in turn give you an idea, which in turn causes you to write this article in a way that your readers haven’t seen before, then I have released something in you, very intentionally. That’s why I’m sat here talking to you. Businesses must understand that the reason for doing a job is more important than the job itself. This is the difference between honest pay for honest work and meaningful work for meaningful pay. It is meaningful work that is very important now. VS: Managing talent is as important as attracting it in the first place. How do you keep employees engaged in a business’ mission once they’ve joined a team? BK: There’s a notion of attracting the talent that comes to you, as if you can somehow sell something. But think of the last major purchase you made, personally. I’m going to guess that you probably researched this product or service, found all the different people that could offer this to you, selected the last two or three of them that you were interested in, and before you met the person you actually bought it from, you had already pretty much made up your mind. In the event, you didn’t buy it from your first choice because of any selling they did. That’s the way it is today. The two or three finalists in your choice had made themselves known to you somehow. But they didn’t come and tell you anything. The same is true of recruitment. You’re not finding the talent; the talent is finding you. Business leaders must ask themselves: have you made a mark in your environment, society, markets, town, business or industry? Have you made a mark that the talent you desire will have noticed? That’s how you sell your employer brand; never knowing who you’re selling to. VS: Your talk covers the concept of stewardship for business leaders. Why is this important in talent management? BK: In employing a person, you have an obligation to them that people don’t fully appreciate. You are a steward of the assets entrusted to you. As a steward, you must leave behind a richer set of assets than that which you inherited at the beginning of the year. The most important asset you’ve got is the people that were entrusted to you. So, every individual in your company has to be richer at the end of the year than they were at the beginning of the year. That’s an obligation you undertake. Should you ever come to a point where you conclude – for whatever reason – that you cannot enrich an individual in your company any further, you have a responsibility to absolve yourself of this stewardship obligation you entered into. To suggest that you will let them stay out of compassion is convenient, but it’s pure cowardice. You’re failing to fulfil your stewardship obligation. If I left my phone here and asked you to take care of it while I go to the restroom, and I’m gone longer than you thought and you need to leave, would it be fair on your part to leave the phone here and walk away? VS: No; it’s my responsibility to find out what happened to you, and try and return it. You’ve got to do everything you can to grow that individual, but at some point, you must also officially absolve yourself of that responsibility. You cannot ignore it. VS: We recently covered so-called workplace zombies in another article. Are these the employees you’re referring to? BK: I often offer two thought experiments on this point. First, imagine you can let go of all your employees with no legal issues. The very next day, you can hire any of them back that you wanted and they will return. The difference is that anyone you hire back, you must pay 10% more. Would you take this deal, Mr. CEO? Or, would you rather stick with the team you already have? Conversely, suppose you gave every employee one year of pay on December 31st, and on January 1st, they have two options. They can leave, or they can give you back that one year of pay, and come back to work. How many employees will come back to work on January 1st? In both of these experiments, we are using money to ask a question: are you accepting the status quo – which is incumbency – because it’s the easier thing to do, or are you accepting it because it’s the better thing to do? Businesses live with incumbency. See that couch, there? BK: Anyone who’s been around a while has a couch they bought ten, fifteen years ago that they really don’t like. They bought it fifteen years ago. It’s still good; nothing wrong with it. But would you buy the couch today? Absolutely not. Why not throw it out? You have the couch because it’s there. You wouldn’t buy this couch today, however. The same is true in the workplace. CEOs must ask themselves: how many of my employees are incumbent? Are they there just because they’re there? VS: Thinking about businesses that have been recruiting in the same way for the last twenty years; where do they start? What are the steps to change talent-management in-house? BK: We’re a marketing company. Our research shows that 78% of purchases are made for one of two reasons. The first and larger reason, explaining 40% of sales, is recommendations from friends and family. The second, explaining around 32%, is recommendations from strangers – people with an anonymous name on the Internet somewhere. In both cases, we take this advice over a guy in the store who tells us to buy something, because we don’t trust the guy in the shop. It matters less whether the guy in the store sold you the item in the first place. In your mind, you had already bought it; his choice was simply to lose the business or not. This is the question businesses must ask themselves. People join a company because they’ve heard good things about the company. It’s not the company who sold to them. Again, this is the case of the McDonald's employee and the Starbucks employee. I am not talking about the McDonald's employee, who belongs to a very different workforce. But consider the Starbucks employee. They came to Starbucks specifically. The McDonald's employee applied at five different places, and Burger King said, ‘Pass this test. Can you put your finger in the fat?’ and the guy failed the test, but at the next place, they hired him. One finger short, they hired him. He just wanted a job. The Starbucks employee didn’t apply at five places. He wanted to work for Starbucks. Cornell graduate, English major, can’t find a job, but he’s going to be a barista and he’s going to work at Starbucks, because he really believes he’s changing the world one cup at a time. I don’t care if he’s right or wrong. Starbucks has a purpose that he believes in. Did Starbucks sell him the job? No. So, companies have to present themselves to the world as a citizen with a purpose, not a citizen with a business. Our thanks go to Balaji for talking to us. Enjoyed this piece? 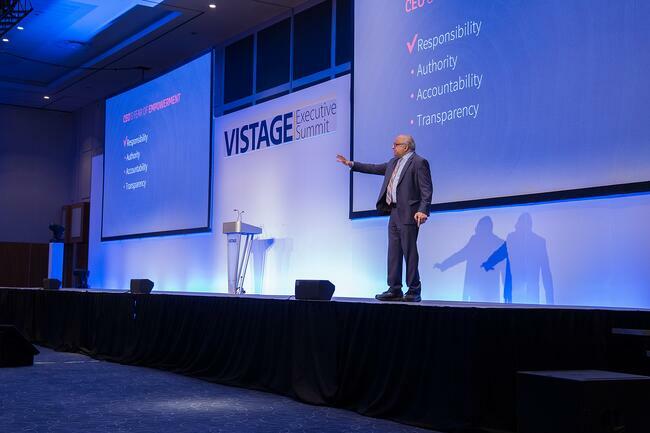 Read our article on what Vistage members are doing to attract and retain the best talent.